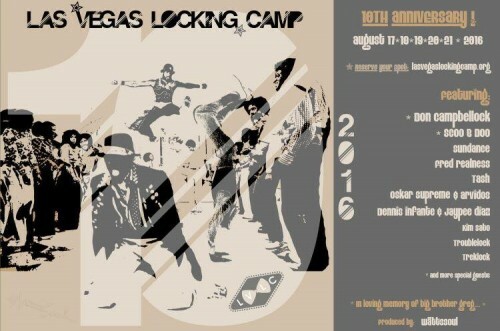 Truly honored and humbled to be teaching at the 2016 Las Vegas Locking Camp, alongside my GroovMekanex brother, Jaypee Diaz. We are grateful for this opportunity to share locking from our Bay Area perspective. To be even considered to teach on the same bill as the creator Don Campbell, pioneers like Scoo B Doo, Sundance, and the LVLC alumni staff is a true honor. My first camp was in 2013 and it was such an amazing experience learning, listening, and talking to the pioneers from Tony Go-Go, Scoo B Doo, Damita Jo, Sundance, and connecting with all lockers who are keeping the dance alive from other countries. Thank you Tash for all the love you’ve shown us through the years.